Vir Das has always been blatantly honest about his views on the world's socio-political climate, and has freely mocked US President Donald Trump. The actor-comedian feels he is going to be the "ultimate test of humanity's tolerance". Asked what he feels about Trump's impact in politics and social media, Vir told the leading publication in a recorded response from Mumbai: "Donald Trump is going to be the ultimate test of humanity's tolerance. I think you have to think of Donald Trump as like an injection. At some level, it hurts but when you are done with the injections, you feel better. So, I think when we are done with Donald Trump, we will all feel much better." This is not the first time Vir has put out his opinion on Trump. Last week, he compared the US President to the "Star Wars" movie series that keeps coming back, and called him America's version of an "arranged marriage" in a show. That is not it. The 39-year-old comedian has always managed to weave political issues and personalities in his jokes. Does he not fear landing into a soup, given the current political atmosphere? "No, I don't think so. If you base your comedy on truth we are going to be okay. I also think that as long as you operate within a certain zone of intelligence regarding your political experience most people understand that this is parody and not to be taken seriously," he said. Vir said his live shows every "political spectrum". "Whether they are left wingers or right wingers, centrists -- they are all sitting under the same roof and laughing at the same thing even if they disagree... That's the beauty of comedy. If we disagree about something does not mean we both can't laugh on the same thing and in that way it will bring us together," he added. He is now coming up with a new online comedy show called "Losing It". He describes it as a "completely different show". "It will be new topics and jokes.... This is an edgier show and a lot more personal," he added. How does he see the immense popularity of the digital world? "Digital place has nowhere to go but up. I think India has possibly the most or the second most amount of smartphones in the world. Most content is watched on a smartphone right now, so there will always be a demand for stand up comedy specifically because people need to laugh at least four times a day. So, for comedy and comedians the road is only going to get better." Vir has also bagged Warner Bros' series "Whiskey Cavalier". This marks his second outing in the American television series space after "Theory". He says the growth of Indian talents working on a global platform is happening now because the audience wants to listen to authentic voices. "I think it stems from the fact that there are a lot of Indians who are watching content. We are of one of the largest audience in the world and that audience needs to be catered to... That audience is looking for authentic voices." He credited newly married actress Priyanka Chopra for opening the flood gates for Indian talents in Hollywood. "A lot of credit goes to Priyanka Chopra for being that first person opening that gate for us and post her a couple of great artistes, it is becoming important to networks to encourage that prospective," he said. The "AndhaDhun" star, who has been a part of theatre group Aaghaaz from DAV college Chandigarh, says he consciously takes up films which have a sprinkle of realism. "I come from a theatre backdrop, because of that my choices are different. I have done a lot of street theatre... While we used to that, we used to go to the length and breadth of the country. Street theatre is about dealing with taboo subjects and social issues and I think our group was the first one which made street theatre entertaining," Ayushmann told the leading publication . "Back in the day, it was very morose, dark and hard-hitting," he added. Ayushmann rose to fame with "Vicky Donor" and then starred in endearing films like "Dum Laga Ke Haisha", "Shubh Mangal Saavdhan" and "Badhaai Ho", which entertained with a message. "The kind of films I am doing are extension of my street theatre. They are real, based on taboo-breaking subjects, novel but at the same time entertaining. If they are no takers or audience to watch it then what is the point. We had to take the middle path," he said. Ayushmann will next be seen in "Dream Girl", which also stars Nushrat Bharucha. The two will be seen sharing screen space for the first time. Almost two years ago Mahira Khan and Ranbir Kapoor’s photos from New York which was seen by everyone where she was talking and smoking outside a hotel and she was blackmailed for the same. 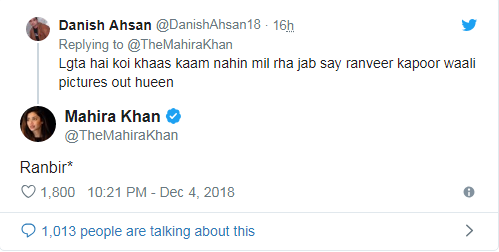 Ranbir and Mahira gets angry and says it was a personal matter and now recently a social media trolled her for the same and the actress fumes into anger and gave a befitting reply. It will be interesting to see Ileana D'Cruz has been roped in opposite John Abraham in Anees Bazmee's Pagalpanti. Anil Kapoor along with Arshad Wasi will also be a part of the film giving viewers exciting and funny story line along with Ileana romancing John. 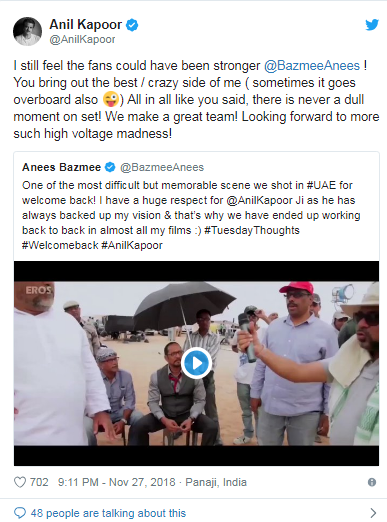 Two days back, Anil Kapoor tweeted about their previous film, Bazmee. Even after lots of ups and downs Sara Ali Khan and Sushant Singh Rajput’s Kedarnath is all set to release on this Friday. Movie songs have captured the heart of audience and according to media reports, the film will open to around Rs 5 to Rs 6 crore at the box office which is a good start. Rumours are widespread about Malaika Arora and Arjun Kapoor that the two have been dating since long and preferred not to disclose the same. But with their actions it seems like there is something cooking between them since in recent times, when Karan Johar shared a picture with Malaika, who is his co-judge on India's Got Talent, Arjun was quick to comment on the post that “Green with envy,” Arjun made it clear that he was jealous that Malaika was posing with Karan.